Note: This is the previous release, not the newer WAY BEYOND FAIRLIGHT R2 release. 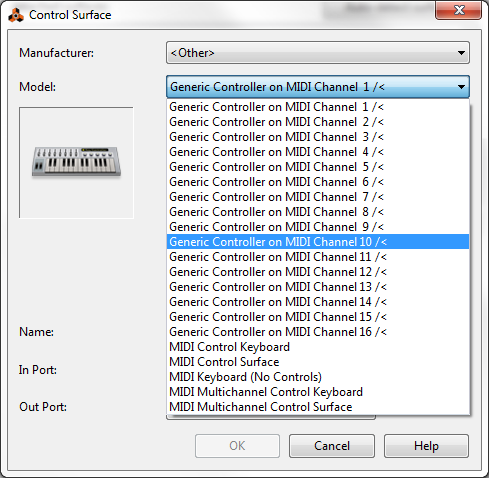 If you have a controller capable of sending MIDI messages on multiple MIDI Channels, like an M-Audio Axiom's 4 Keyboard zones (so 4 MIDI Channels from the same keyboard) plus the Pads on Channel 10 or an Arturia BeatStep PRO that can send 2 sequences on their own MIDI Channel (1 and 2) and its Drum sequencer on MIDI Channel 10 plus the controller on, say, MIDI Channel 16, etc, then you certainly felt the need for a MIDI Channel-aware type of Remote Codec like this one. Taking the BSP example, here's an example on how to get its 4 sources of MIDI into Reason with this Remote Codec+Map. You can ignore the Out Port on these generic maps unless you plan to customize the Codec too. Repeat the above steps for each of the BSP sequencers (since that's the example I'm using here). 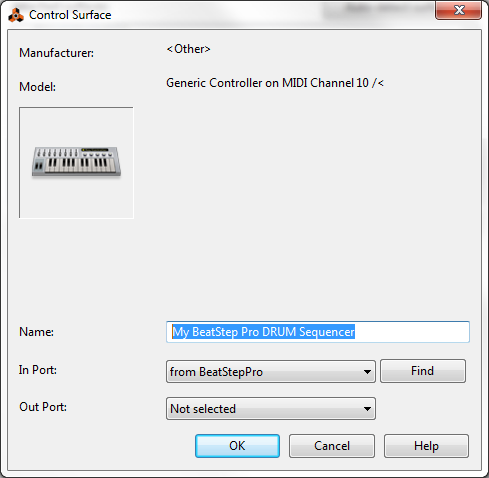 So, you'll add 4 Control Surfaces for BSP's Controller Mode, Sequencer 1, Sequencer 2 and Drums, each with its respective MIDI Channel set to what you're planning to use in the BSP and all of them pointing at the same MIDI In Port, since that's the one the BSP will be sending its MIDI data. Don't worry with Reason's yellow warning. 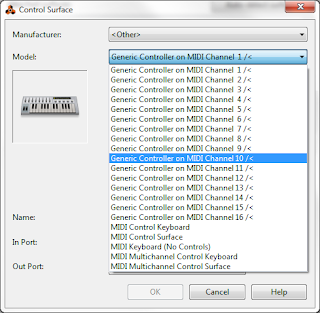 That's expected since you're declaring multiple Control Surfaces with a common MIDI Port. It warns you but won't block you from using them like it used to on much older Reason versions. ...and that's about it. After this, you can lock any of those controllers to specific rack devices and each will only receive the MIDI notes (or CCs in the BSP Controller mode's case) that are being sent on those specific MIDI Channels. 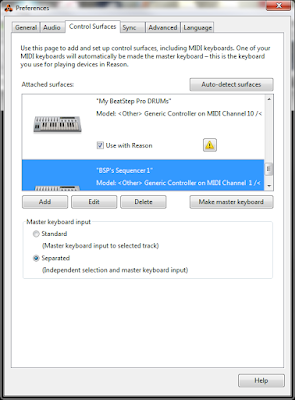 The big difference from using this solution instead of doing the MIDI Channel redirection into rack devices through the Advanced MIDI Device is that with this Codec you're able to record the MIDI data into the Sequencer, something that's not possible nor the main purpose of the Advanced MIDI Device. Update: This new 1.1.1 version allows MIDI feedback for those wanting to send back to the controller the changes being done through the Reason GUI. Use only if your controller is prepared to receive the same CCs it's sending on each control! ...oh, and speaking of the Arturia BeatStep PRO, I'm still planning to do a specific Codec+Map for it someday, but I'm waiting for it to stabilize its feature-set so I can see how to take proper advantage of its closer integration with Reason through a specific Map. Reason's BV512 Digital Vocoder rack device always had a very useful behavior regarding its use as a MIDI-to-CV utility device. Before the Kong Drum Designer rack device, which is typically the easiest and preferred device to convert a MIDI Note (i.e. Pad hit) into a CV Gate output (each pad has a CV out gate at the back) the BV512 Vocoder was the only rack device offering a similar behavior. The BV512 MIDI Implementation made it respond to a range of MIDI keyboard note input to control each of its 32 Vocoder Bands. 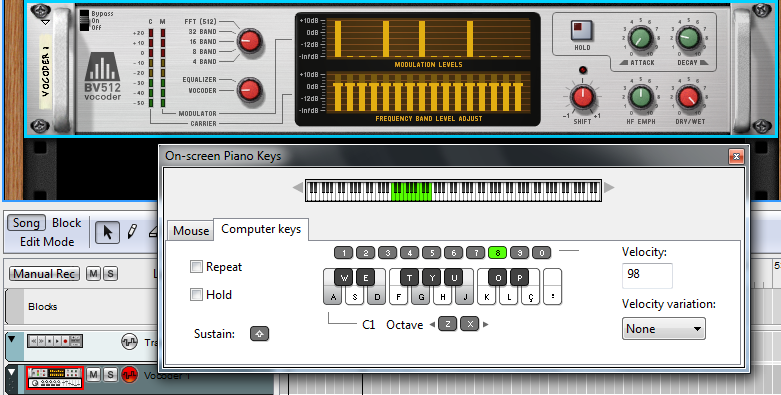 This allows various cools tricks related with directly controlling specific and multiple bands while in Vocoder mode. The 1st 16 of those Vocoder bands, when activated (either by audio modulation or MIDI note input) will have their respective value output as CV at the back of the device. So, as you can see, prior to Kong, this was the perfect way to get at least 16 MIDI Note-to-CV Gate/Velocity output. ReDrum could be used but it only had 10 outs and only allowed Trigger CV out instead of Gate CV out (which is the only way to respect the Note duration). BV512 did its CV tricks tirelessly, no matter if there was an audio cable connected to the modulator audio input or not. It even worked perfectly while the "Enabled" switch was Bypass or Off. Well... guess what? Apparently, allowing Vocoder Band control through MIDI input when there's no cable connected to the modulator audio input was... "a bug" (kinda). This "bug" was fixed in Reason 7 ...so, yeah, you guessed it: Any Song or Combinator patch relying on the good'ol BV512 original behavior changed from a state of "coolness" to "borkedness". Administrivia: "The Blue Chapter" aka "let's try AdSense"
This was the 1st of a few more changes to this blog. I'm going to slowly "clean" it up of all the extra link sections, now temporarily pushed to the bottom. Already added a "Spare Music Products on eBay" section because I finally went through my license collection and found a few unused spares that should really go to someone that will use them. I have more licenses waiting to be added to that list, but there are some limits to how many/much one can have on sale, so... there's actually a queue behind that section. Next, will be experimenting with AdSense (configure your own Ad experience here**). Not sure how that works but that's something that I never bothered to try and I guess it's time to, so I'm waiting for the approval thingy. After that, don't be surprised to see some ads somewhere around here. Sorry for this "null content" administrivia post but I wanted to give some kind of heads-up about the future use of AdSense ads before actually adding them to the blog. Edit: **I'm slowly finding stuff about this Ad stuff. The Converse Rubber Tracks Sample Library: Free musical sample/stems sharing done right! I'm extremely impressed with this initiative from Converse (yes, that sneakers company, no less!!!) through their Converse Rubber Tracks community-based professional recording studio in Brooklyn, NY. The design of the site, the user experience and interface, the filtering and searching capabilities, proper metadata details (who did what, where and when, tempo(s), key(s), etc) and obviously the amount and the quality of content are totally amazing. One-Shots, Loops, Stems on lots of genres, playing styles and instrument types. I'll say it again: WOW! ...and why am I posting this here? Beta 8 squashes all the various bank folder levels into just 1 level per folder mainly on "7 from the Web" and on most on the "8 Instruments", which I'll be working on a bit more before the final release of V1.0 of this ReFill. Beta 7 zip download access will be removed soon, btw. Could be an automatic process, right? Manually tempo-map a variable-tempo audio track with no embedded tempo information. ...which Ryan Harlin explains perfectly. It also briefly explains those, sometimes intriguing, audio clip icons that show up at the bottom right corner of the clips, something I remember seeing a bunch of users asking about in the old forums. When I first heard of the original Korg Kronos oriented 'dx7_200k_collection' project I thought that it would be interesting to try and purge it from all the inevitable duplicate Banks and Patches included. This happened a few weeks before the release of Propellerhead's own version, the PX7-200k-Collection ReFill for their PX7 FM Synthesizer. After reaching a point where I already had all duplicate SysEx Bank files removed and was going through each bank sets, performing the conversion to .repatch format using the indispensable Propellerhead's DX7-PX7 Patch Converter, I realized that the hardest part of this dups removal project was going to be the surprisingly high amount of cases that I had to decide which bank should be considered the "original" so I could remove all the corresponding duplicates from all the others. Well, once PH released their 200K ReFill version, I thought that it really wasn't worth my time to revisit the project and go through the very time consuming process of doing it properly even though still thinking that it would be nicer to browse a collection of unique PX7 patches, even if similar sounding, at least free of exact copy duplicates. Recently, a sequence of (soon-to-be-deceased) PH Forum threads (mainly joeyluck) reignited my interest on this matter. I decided to have a different approach and this time I would search the web for similar or at least sub-sets of this huge 200K collection, trying to identify the original sources of the included banks. 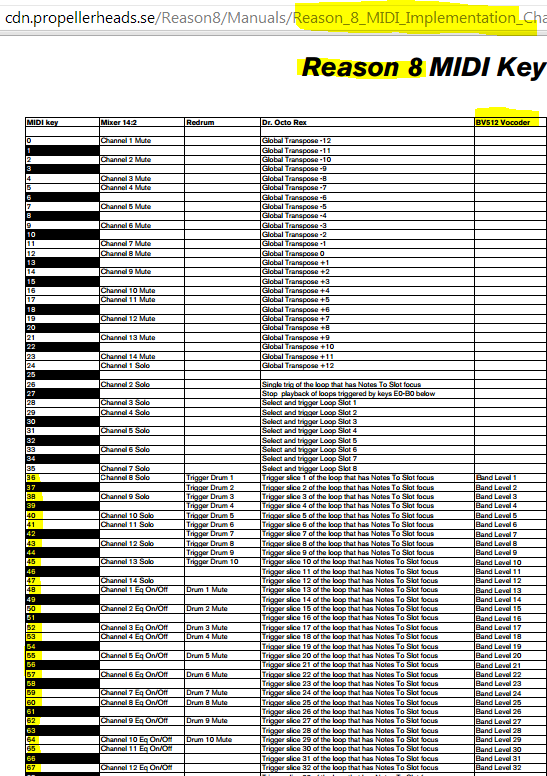 For this, the most useful resource was Bobby Blues DX7 pages which allowed me to better organize some of the more recognizable banks into some sort of historically meaningful folders. While doing this, the same PH Forums (via Jamesville) referenced another project that achieved a unique Bank count (but not unique patch count), BlackWinny's DX7 collection. These two allowed me to further break down the amount of unsorted banks that the 200K source provided. "PX7 200K Collection (30102 Uniques) Koshdukai's Slim Version 1b6 ReFill"
"PX7 200K Collection (30102 Uniques) Koshdukai's Slim Version 1b7 ReFill"
The final Version 1 release will happen once I'm sure there's no unwanted empty folders or anything weird with folder or file naming, etc. Am I happy with it? Nope :) ...that's why I'm working on Version 2, keeping goals 1 and 2 but dropping the importance of the 3rd goal because it caused a lot of insignificantly small banks once removed of all the duplicates they had when compared with "higher hierarchy" sources (that's why the folders are numbered). Basically, in Version 2 I'm going to drop the "from the Web" folder completely and feed it into a better organized "Instruments" folder. There's also a very critical issue that undermined Version 1 and will condition me working on Version 2: The DX7-PX7 Patch Converter has some bugs and limitations regarding particular chars used in the patch names which result in existing patches being skipped from the conversion process not being included in the final converted bank zip. This is why there's some patches missing from known banks which I would like to see included in Version 2. I'm going to wait for these issues to be fixed in the converter to start re-building that new project. Needless to say, suggestions and comments pin-pointing issues with this beta are very welcome! empty folders removed except the ones at "2 Other Cartridges\Bo Tomlyn\"
small adjustments to the ReFill splash/icon image. There are still A LOT of 1 or 2 patch folders in Beta 7 that I'm thinking of simply discard their original Bank folders and put them in the higher folder. Still deciding if I should do that in Version 1. Why? Well, I don't get along with Facebook (and it doesn't get me either) so this blog is now basically my default place to publicly comment on what's going on in the world of Reason. Along with that, the time I usually spend browsing forum threads for any issues that catch my eye to jump in and try to help will now be spent here. My tendency to comment and provide feedback about Reason in PH own forums was, I see now, a natural act of keeping it in context, within a place where almost all cared about that specific subject, apart from my quick snippets of text on Twitter, trying to express my more immediate opinions on things as they happened (which I'll keep doing, because Twitter is natural to me, unlike Facebook). PS: Be prepared to find a lot of dead-links around here since there are many pointing to PH Forum threads and posts. I fell into the dumb assumption that all that info would be "indefinitely" secure and available, at least as long as the www.propellerheads.se had a presence on the web. How naïve of me.